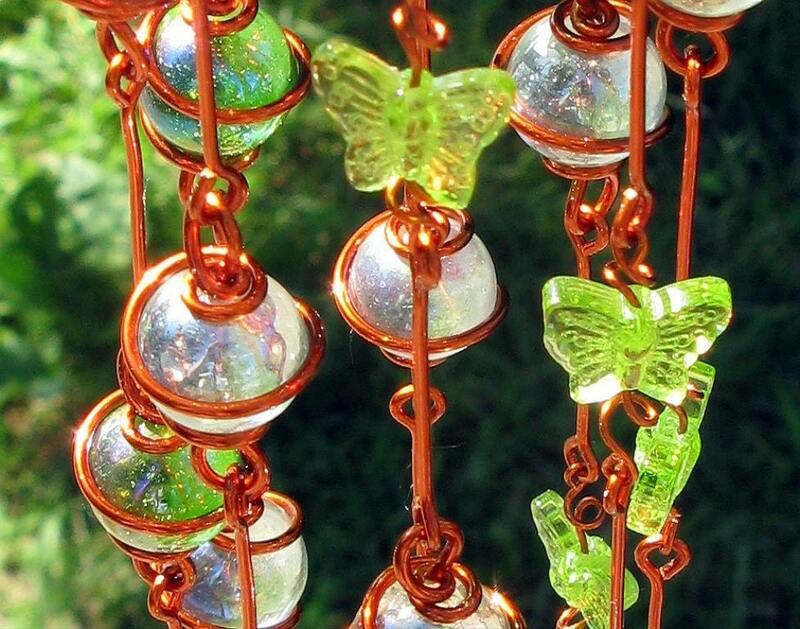 This sparkling suncatcher begins with a mix of 48 iridescent spring green and clear glass marbles, each individually hand wrapped in solid copper wire with a baked on enamel finish (to retard oxidation). It is accented with a cascade of 16 light green glass butterflies that float in a spiral from top to bottom. Beautiful indoors or out, the marbles shimmer like dewdrops on a spring morning! Throughout man's history, butterflies have been seen as an iconic representation of transformation and the acceptance of change, a symbol of renewal and rebirth and the elevation from earthly matters. In Greek mythology, Psyche (literally translated meaning "soul") is represented as a butterfly. In China, it may be seen as immortality and in Japan, a white butterfly symbolizes the soul of a departed one. Early Christian tombstones were also decorated with butterflies. Plus, Copper is the traditional gift for the seventh anniversary. Overall width of this piece is 2.5" and the length is 24" from the top of it's copper hook to the tip of it's bottom marble. This suncatcher is ready to ship and will be mailed Priority Mail within one business day of payment. All of my items are handmade in a non-smoking, pet friendly home. Please click the "Shipping & Policies" tab on this page for all the mumbo-jumbo relating to shipping, returns, sales tax, etc., etc., etc. Even prettier in person. Perfect gift for people who sparkle. Thank you for the swift transaction! Arrived well before Chrstmas. Love this! very colorful. Ordering another one. This is a beautiful addition to my kitchen window! Amazing stones and intricate copper work. Shipping was MEGA fast! I ordered it on a Monday and it was in my mailbox on Thursday. Will you combine orders to save on shipping? Yes, I do combine orders whenever possible. If you want an exact estimate of a combined shipping cost, please give me your zip code and let me know which items. I'll get back to you as soon as possible. How soon will my item ship? All of the items that I have listed are ready to go so your purchase will ship within one business day (and, quite often, the same day). Can items be personalized with specific color marbles or special stones? stone(s) tickle your fancy and I'll try my best to meet your needs. This is a gift. Can I add a note or gift wrap? Just let me know in the "Note to seller" section and I'll add a note to your gift (I've become fairly proficient with Print Shop!). Gift wrapping can be a little trickier but if you'd like a little spiffier presentation, I'll give it my best shot. the term "free shipping" is a misnomer; somebody has to pay for it. As I price my items to allow for a modest profit, I can't afford to absorb the shipping. I also don't want to raise my prices to cover shipping expenses which would give an artificial "free shipping". Plus, when offering free shipping, it negates the price reduction that normally comes with multiple purchases combined into one package. Rest assured that I only charge my customers what the USPS charges me and that I will refund overages. In my experience, this is the fairest and most transparent method for calculating shipping costs.